It’s been a cold winter, but the Winter Carnival Chili Cook-off is sure to add some heat. 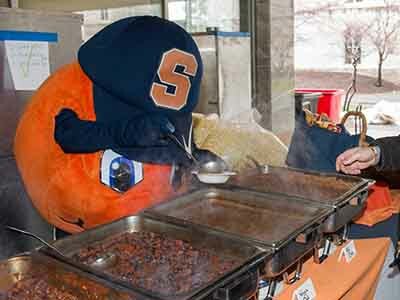 This year’s cook-off will take place on Thursday, Feb. 21, at 11 a.m. (and last until the chili is all gone) at the Huntington Beard Crouse Patio. Chili tastings are free. The Traditions Commission is inviting all students, staff and faculty to submit their favorite chili recipes by Monday, Feb. 11, at 8 a.m. The recipes will be prepared by SU Food Services during the event. The annual Winter Carnival will take place this year from Feb. 19 to 23 and will feature plenty of indoor and outdoor activities for the campus community to enjoy. For more information, email the Traditions Commission or tweet @SUtraditions.